They held varying titles: father and husband. Brother and son. Friend and teammate. Their jobs included play-by-play announcer, sports information director and director of basketball operations. But they shared a purpose: helping others. Kendall Durfey was always there to give a supportive smile or thumbs up. Bjorn Fahlstrom was at the pilot’s side whenever he was needed. Nate Fleming and Daniel Lawson motivated their teammates with every practice. Will Hancock was almost assuredly in the players’ corner. Brian Luinstra did everything he could to get players healthy. Denver Mills flew the “fun” plane, and Pat Noyes hosted the team for card night. Bill Teegins got it, in more ways than one. Jared Weiberg was available to join a player at the gym at any moment. 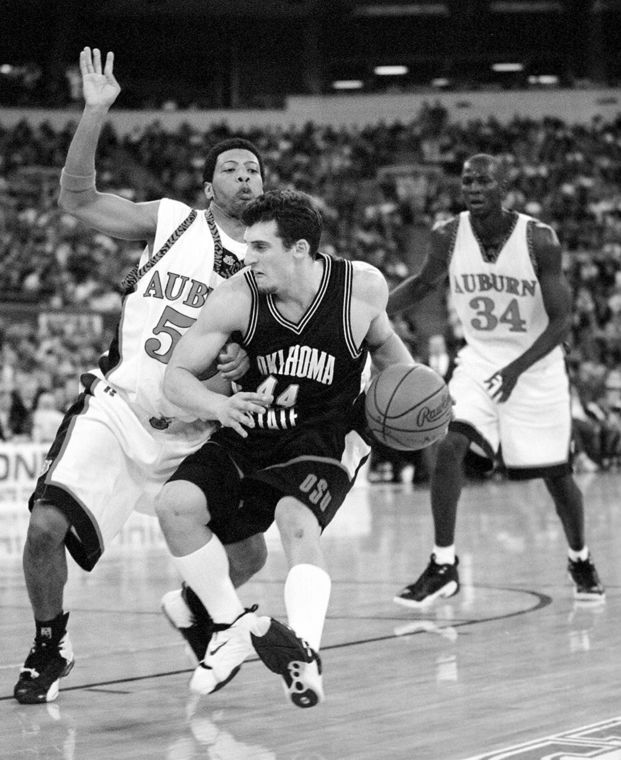 As former Oklahoma State guard Doug Gottlieb advanced through college basketball, he learned that everyone he met was there to help him. The Ten embody that. When 10 men connected to the OSU basketball team died in a plane crash in Strasburg, Colorado, on Jan. 27, 2001, Gottlieb lost a support system that couldn’t easily be replaced. “They were all helpers,” Gottlieb said. “The greatest thing you can do in basketball is help your teammates make a basket. That’s what sports is about. That’s what it teaches you is doing things for other people and you all look good because of it. That’s what all of those guys were. Those are the kind of guys that all they ever do is help you look good, play good, feel good about your experience in college. Gottlieb, now an analyst with CBS Sports, graduated from OSU the year before the crash. The Cowboys, thanks to Desmond Mason’s 18 points per game and Gottlieb’s Big 12-leading 8.62 assists per game, reached the Elite Eight in the 2000 NCAA Tournament. It was a great era in Cowboy basketball, a season placed neatly between Final Four appearances in 1995 and 2004. It was when basketball — not football — dominated Stillwater. That’s seemingly what the Cowboys experienced March 26, 2000, when they lost to Billy Donovan’s Florida Gators, ending Gottlieb’s college career and that of six other seniors. But devastation was an exaggeration, at least on that day. It didn’t fit. It was an empty word, its meaning realized 10 months later. The plaque is easily seen but hidden away. A left turn after the south Heritage Hall entrance leads to Gallagher-Iba Arena’s media workroom. It details Hancock’s infectious smile, his passion for sports and the goodness of his heart. The Ten, in a way, live on. Through a variety of donations and sponsorship efforts, scholarships totaling more than $300,000 have been given to students at OSU, Oklahoma, Texas, Kansas, Wichita State and others in honor of the Ten. The scholarships allow the legacy of the Ten to continue. Carolyn Huffman established endowed scholarships for student athletic trainers at OSU, KU and WSU in honor of Luinstra, her late husband and the Cowboys’ former trainer. 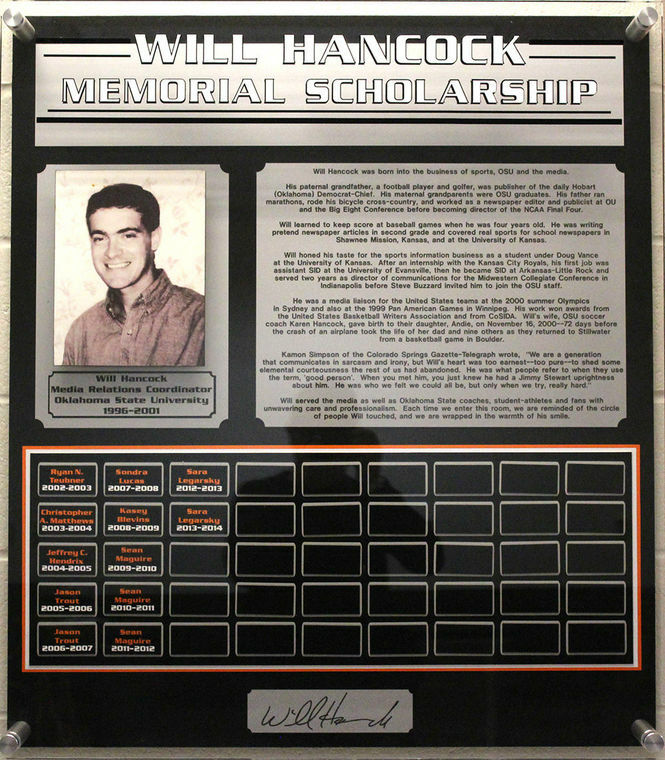 The Will Hancock Memorial Scholarship is given annually to a graduate assistant in the athletic communications department and named after Hancock, the Cowboys’ former sports information director. Sean Maguire, who graduated from OSU with a degree in sports media and advertising in 2010, was a three-time recipient of the scholarship. Maguire works as assistant director of athletic communications for OSU Athletics, helping connect media with athletes, much in the way Hancock did. “I didn’t know him personally, but I kind of feel like I did just from talking to so many good friends of his and seeing how much they still miss him today,” Maguire said. “From what I’ve heard, he was really good at his job, too. I’ve heard that from people at other schools that worked with him. I’ve heard he was about as good as they come. The scholarships can’t return loved ones lost, but they lighten the heartache of an OSU fan base that for 15 years has begged for another “Nate” chant for Fleming or another “He got it” call from Teegins. They inspire the next set of helpers. Mills’ plane was the place to be. It was the fun plane. Sure, it was a slower than the other two planes OSU traveled in, but after a loss, the Beechcraft Super King Air was the perfect place to hide from frustrated coaches after a loss. They were rarely on board, and by the time the plane landed in Stillwater, the coaches had already left the airport. “Denver Mills’ plane was the plane I always used to ride on,” Gottlieb said. “Whether it was because I was perpetually in the doghouse or because there usually wasn’t coaches on that plane ‘cause it was slower. It took until August for Gottlieb to get back to Stillwater after the crash because of his professional commitments to teams overseas and the Lakers. He hadn’t been gone long, but his memory of the place he fell in love with had fadedit landed, his visions distorted as he became older, but the students seemingly got younger. When Gottlieb came back, that held true for every spot on campus but the basketball office. Tragedy weighs on you, whether you’re the coach who waited at the airport for 10 men who never came home or the student who cheered them on from the stands of a newly renovated arena. OSU coach Eddie Sutton was forced to call 10 families to tell them that their son, husband or father was on the plane. It weighed heavily on him. Gottlieb and Sutton speak every couple of weeks. The Ten came up in a recent conversation. Sutton, who was unavailable for comment, didn’t seek therapy immediately. Gottlieb said the pressure of the remaining season, which saw Sutton’s Cowboys lose in the first round of the NCAA Tournament for the first time, kept the coach from helping himself. Stillwater knows better than anywhere else that tragedy, the feeling of vulnerability, never gets any easier. Another plane crash killed four Nov. 16, 2011. Four more died when a car crashed into the homecoming parade at Hall of Fame and Main on Oct. 24. The pain is deep, but it is part of the Stillwater’s fabric, a pain each Cowboy shares. “Those are three parts of the university that make the university special,” Gottlieb said. “Oklahoma State homecoming is an incredible, incredible weekend, and it happens at the parade? Like, are you kidding? What’s more special than Oklahoma State basketball and Eddie Sutton? And we have a plane crash? I mean, Kurt Budke turns the women’s program around, and I’d always thought to myself, ‘No way anyone I know is ever involved in a plane crash again. What is the statistical possibilities? None.’ And yet, sure enough, it happened again. One cowboy kneels, but the others run. Every April, OSU students, alumni, Stillwater residents and others take part in the Remember the Ten Run. That group includes the OSU men’s and women’s basketball teams. The run annually awards scholarships to 10 students pursuing their master’s or doctorate in a counseling- or psychology-related specialty. The scholarships, given each of the past five years, are worth $500 a semester. It also raises money for University Counseling Services. But the run is about more than the money, said Karen Hancock, Hancock’s widow and an assistant coach for the Cowgirl soccer team. Gottlieb and his family have participated in the run four times. Each run shows him more the impact each of the Ten had. “It’s not just 10 people that died in a crash,” Gottlieb said. “It’s that they were 10 individually very special people for very different reasons. I would like, if possible, for them all to be remembered, even if only for one thing, to be remembered individually because that’s how we remember them. This article was written by Nathan Ruiz and originally appeared in The O’Colly on January 27, 2016. It has been republished with the author’s permission.